Drawings will be held at 12:00 p.m. on the above days at the Great Rivers United Way office. The fine print: 1. TIMING: This incentive promotion includes two separate sweepstakes. Individuals and employees of companies that turn in donation results before 12:00 p.m. Central Time on Friday, October 26, 2018, will be eligible for two sweepstakes drawings. Donation results turned in between Friday, October 26, 2018, 12:01 p.m., and Friday, November 30, 2018, 12:00 p.m., will be eligible for the Friday, December 7, 2018, drawing. Participants must be legal residents and at least 18 years of age. 2. PRIZES: Eight individual winners will receive one of the eight prizes listed above. Odds of winning depend on number of eligible entries received. 3. 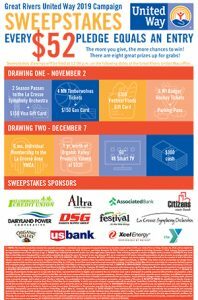 ELIGIBILITY: Any Great Rivers United Way donor that gives $52 or more will be automatically entered for up to 20 chances to win, one entry per $52, up to a maximum of 20 entries. Entry without donation can also be made by sending a letter (one letter per envelope per entry) to Great Rivers United Way, ATTN: 2018 DRAWING, 1855 E. Main St., Onalaska, WI 54650, containing name, address, and phone number. Online entries will not be accepted. A limit of 20 entries allowed, automatic or otherwise, per person. Employees of Great Rivers United Way and members of their immediate families are not eligible to participate. 4. ENTRIES: Entry letters must be postmarked and pledge forms/eligible employee lists must be received by Great Rivers United Way by 12:00 p.m. Central Time seven days before each sweepstakes drawing. Great Rivers United Way will not be responsible for companies that fail to submit their employees pledge forms or list of eligible employees by this date. United Way is not responsible for lost or misdirected mail. 5. DRAWING & ANNOUNCEMENT: Sweepstakes winners will be drawn randomly by 12:00 p.m. on the day of each sweepstakes drawing at the Great Rivers United Way office (1855 E. Main St., Onalaska, WI 54650) and announced online (www.gruw.org) the following day. Winners are not required to be present to win. 6. REQUIRED INFORMATION: Winners receiving prizes valued at $600 or more are required to provide their home address, social security number, and to comply with these rules upon presentation of prize. 7. RELEASE: By entering, all participants hereby agree to comply with these Rules, represent that he/she is eligible, and consent to the use of his/her name and/or photograph for publicity purposes without further compensation; unless prohibited by law. All entrants release Great Rivers United Way and each donor company listed above; their respective employees, directors, officers and agents; their respective parent, subsidiary and affiliated companies; and their respective advertising, fulfillment, publicity and promotion agencies from any and all claims of liability in connection with their participation, responsibility for damages, losses, or injuries, including death, personal injury or property damage, due in whole or part, directly or indirectly, from participation in the promotion or acceptance, possession, use or misuse of the prize. 8. RECEIPT OF PRIZES: No substitution or transfer of prize or redemption for cash equivalent, except by Great Rivers United Way due to unavailability, in which case a prize of equal or greater value will be substituted. Great Rivers United Way reserves the right to cancel, terminate or modify this promotion if not capable of completion as planned, and to award the prizes as of that date as provided above. 9. RESPONSIBILITY: Winners will be required to pay any applicable taxes and costs relating to the transactions, including, but not limited to, federal and state income taxes. Participation in this promotion may affect the tax deductibility of your gift. You should consult your tax advisor for more detailed information. 10. SPONSOR: Sweepstakes sponsored by Great Rivers United Way, 1855 E. Main St., Onalaska, WI 54650. 11. ENTRY INTEGRITY: Those individuals that qualify for prizes are automatically and systematically (not manually) entered into the drawing as their pledges are processed. Participating public sector campaigns do provide individual donor information, which is audited, so public sector qualifiers can be assured they will be included and there is little room for human error. Companies who do not typically provide individual pledge information may submit a list of employees that qualify. Those names are added to the data base of automatic qualifiers. Additionally, those people who submitted an entry outside of the automatic qualification process are also entered into the data base. Although we cannot publish the list of all those that qualify, companies can request a list of their employees prior to each drawing. NO DONATION NECESSARY. VOID WHERE PROHIBITED. DONATION WILL NOT IMPROVE CHANCES OF WINNING.